You are here: Home / Blog / Volunteer Knitting Group Leaders Needed! Knit for Peace has a wonderful opportunity to meet others and help out by sharing your craft skills! We are looking for experienced, enthusiastic and outgoing knitters to join our team of volunteers to support existing charity knitting groups in schools, community groups and prisons. Volunteers may also start new knitting groups anywhere in the country. We are looking for experienced knitters who have the time and enthusiasm to support one or more existing Knit for Peace groups. You must also be patient, friendly and reliable, even when it takes someone a whole hour to complete their first stitch! Being a knitting group leader will involve being responsible for one or more groups, regularly attending the groups, helping the participants improve their knitting skills, ensuring a welcoming atmosphere for new comers and liaising with whoever is responsible for the space which hosts the group. 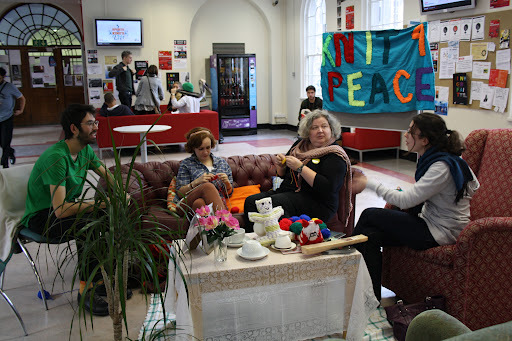 If you are also proactive, you will even be able to set up new groups for Knit for Peace. To come and help us by joining our team of volunteers, please email [email protected] telling him why you are suitable for, and interested in, the role and your availability. For a chat about the role, call Gabriel 020 7794 9835.